A market just for pets! Bone Marché carries quality supplies, products and foods for dogs, cats, rabbits, fish and birds. Top pet brand names line the shelves, giving pet owners quality assurance and peace of mind that the special members of their family are cared for. This pet market is located adjacent to Lunds & Byerlys St. Louis Park. It’s separate from the grocery store, with an independent entrance. Pets are welcome inside Bone Marché if they are on leashes. A pet waste bag and disposal area is located outside the entrance doors. Bone Marché offers specialty dog and cat foods, like Blue Buffalo, Solid Gold and Honest Kitchen. There’s also a wide variety of local suppliers, including Antlers, Espana Grooming, Sojo foods and treats, and Sister Jones dog biscuits. Specialty products found here are unlike those found in the grocery store. The Bone Bar carries everything a dog could want, from Angus beef and rawhide bones, to water buffalo and flavor-filled bones. Bone Marché is also proud to offer a refrigerated and frozen foods section, along with a wide variety of raw foods and grain-free pet foods for owners looking for a more selective food avenue. Bone Marché promises to provide the best pet care products available because they know pets are an important part of the family. 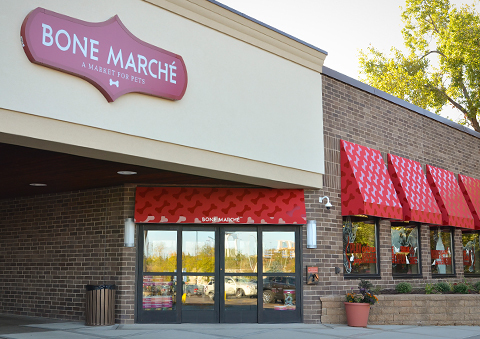 You’ll also find a Bone Marché pet department inside a few Lunds & Byerlys grocery stores. Please note: Pets are not allowed at these locations. Sign up to get special offers for your pet. Text STOP to cancel, text HELP for help. By signing up you agree to receive marketing text messages, which may be sent through an automatic telephone dialing system, from Lunds & Byerlys at the mobile number provided. By signing up, you are confirming you are over the age of 13. Opt-in not required as a condition to purchase goods and services from Lunds & Byerlys.